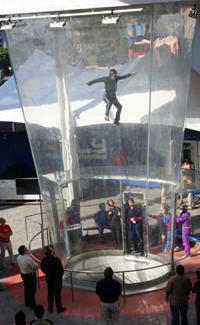 IFly's LA's first indoor plunging simulator: a clear acrylic, 30-foot vertical wind tunnel with two 800-horsepower fans, identical to the training equipment used by the military and pro skydivers -- because it takes years of training to expertly succumb to gravity. The whole thing's hassle-free: after a blessedly short cover-the-basics session, you'll step in to the chamber, get blown upwards, then "fly" for sixty-ish seconds -- like a rollercoaster, without the enchanting odor of churros. Once you're comfortable moving around, they can teach you basic tricks like turns and flips, culminating in Charlie Sheen's signature Terminal Velocity move (the Box Office Flop). Regularly $39.95 per session, IFly's now offering a grand-opening special of two flights for $49.95 -- equivalent to a personal porterhouse for two, with the iceberg wedge being that you'll walk away from this rush with clean underwear.